Amazon.com??? I Thought I Just Contributed to My Church! The good news is that many of these misconceptions could be solved with very simple and transparent communication after someone gives to your church. And the online giving experience is an opportunity for communication that often goes overlooked. 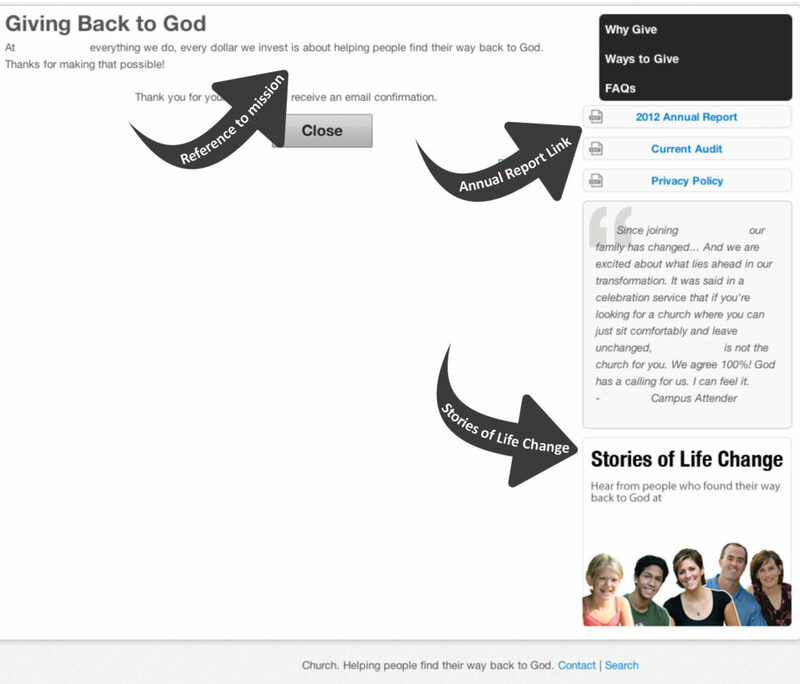 After someone gives to your church online, what do they see? What do they receive? Yep, that sure feels like I’m making a difference with my giving alright! Wow. Two exclamation points on the warning about clicking the back button? What’s wrong with this, you ask? It just feels so transactional … so sterile. I may as well have just completed a purchase for myself on Amazon.com. What’s missing is a direct connection between my gift and the church’s mission. How will my gift make a difference to someone else? What SHOULD happen when one makes a gift online? confirm the amount of the gift. go a step further and make a tie between the gift and the church’s ongoing mission. This is critical! 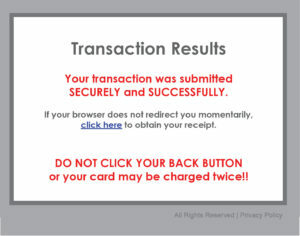 An e-mail should arrive in the giver’s inbox within an hour of your receipt of the gift. 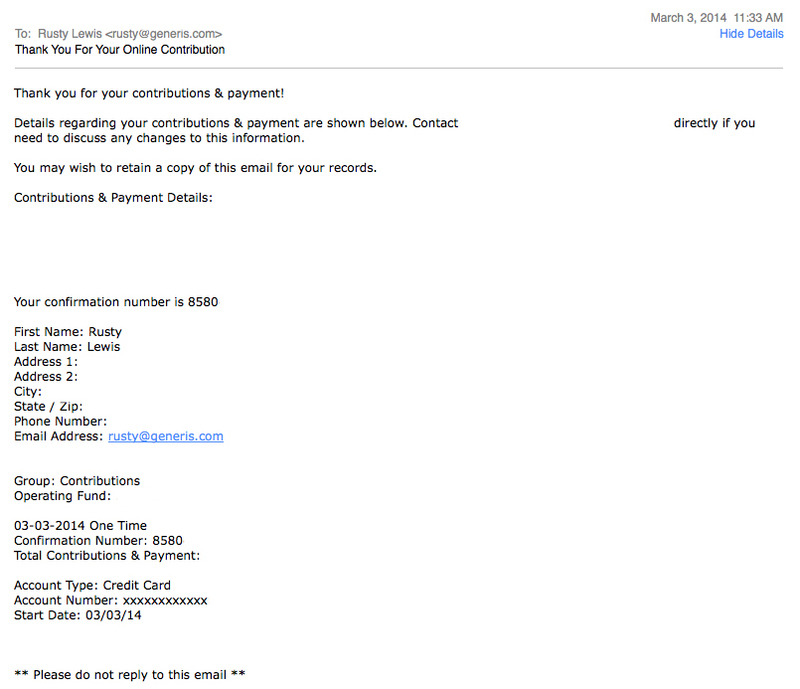 This e-mail should repeat some of what they saw on the webpage, but that’s not all. This is something you are sending directly to the person who gave, so take full advantage of this opportunity! State your ministry’s mission and tell how the gift will enable you to better fulfill that mission. Share recent examples of ministry impact and how their gift makes future life change possible. Link to a recent baptism video or a story of life change video. Provide a link to their online giving statement, if you are making your giving statements available online. Share your ministry vision and goals to reach others in the community and around the world in the coming year. Invite the giver to continue in partnership with you and the church in order to make that vision a reality. Notice on the above webpage example there are several things I have recommended. First, there’s the reference back to the church’s mission. There’s a link to the annual report, and there’s also a place where you can read or watch stories of life change. There’s no question, after going through all these features, that this church is doing great things with the generosity of those who give online. This is the e-mail confirmation I received shortly after I gave online to this church. Again with the mission. (These guys are great about that … it’s so deeply rooted in their DNA, it’s on everything they do!) Then they offer three great examples of ministry impact the church has been able to accomplish through the generosity of the church. It certainly gives the perception that they are stewarding well the gifts received. Do you see how this helps the giver sense that their giving is making a difference in the lives of others, rather than just going to fund the budget of the church? Now, take the screenshots and printouts to your next meeting with your communications or media team and rewrite your pages. Work with your webmaster and online giving provider to make the necessary changes. I would be happy to review your drafts as you develop your webpages and e-mails. Just send them to me at rusty@generis.com. Here’s the point: SHOW people what you’re doing with their generosity. Remove the guess work. Take away the question mark. Be transparent. After all, that will only encourage future generosity. Next, we will look at what the year-end giving experience should entail. In the meantime, how does your church share examples of ministry impact in your online giving experience? How do you tie generosity back to the mission of your church? I’d love to hear from you!